The city of Chandigarh is one of the most well-planned cities in India rather I should say one of the few planned cities, comparable only to few areas in Lutyens' Delhi. Even when compared with Lutyens' Delhi, Chandigarh should win easily. With broad roads and vegetation on both sides of the road, this is one of the greenest cities in the country. We arrived in Chandigarh from Shimla and the cleanliness and order in the city impressed us. Chandigarh is the joint capital of Punjab and Haryana. After partition when Punjab was divided into East Punjab and West Punjab, Lahore became the capital of West Punjab and Shimla became the capital of East Punjab. Later in India, when demands increased to divide East Punjab and carve a hill state, a Punjabi-speaking majority state, and a Hindi-speaking majority state, three new states were created from erstwhile East Punjab. Shimla became the capital of Himachal Pradesh and being on the border of both states and their failure to settle in on any other city as their capital, Chandigarh became the joint capital of Punjab and Haryana. To settle the dispute it was made a union territory. Chandigarh metropolitan area comprises of Chandigarh-Mohali-Panchkula, forming a tri-city area. Chandigarh is the proud creation of many famous architects including Le Corbusier, the famous architect who was one of the pioneers of what is now called modern architecture. Chandigarh is home to the largest of Open Hand sculptures. These Open Hand sculptures represent The Open Hand Movement which, according to Le Corbusier himself, is a symbol of peace and reconciliation. The open hand is open to giving and open to receiving. Among his monumental designs is the Capitol Complex, which houses the Assembly, the Secretariat and the High Court of Punjab and Haryana. The name of Chandigarh is derived from an old temple of Goddess Chandi, Chandi Mandir. The first place that we visited was Sukhna Lake. Situated in the foothills of Shivalik Hills, this lake was formed by holding the waters of Sukhna Choe, a seasonal stream. Due to the problem of silting, later on, Sukhna Choe was made to bypass completely the lake. 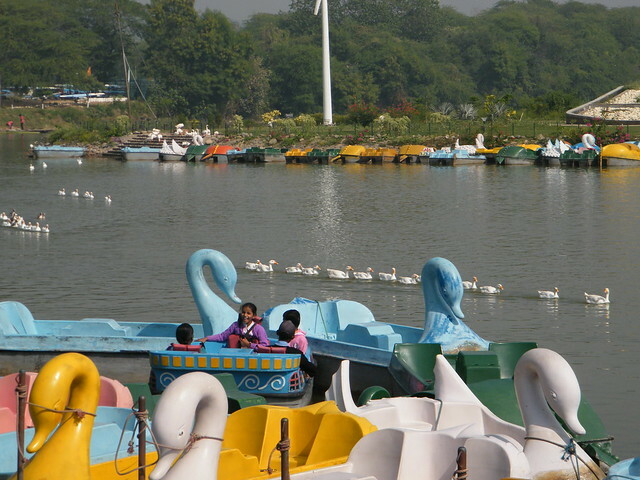 Today this lake is one of the major tourist destinations of Chandigarh. What can be better than starting your lazy morning with boating in a lake surrounded by trees from all sides? We were welcomed in the water by ducks who followed us sometimes but ran away when we got closer to them. Although we were doing boating with safety jackets on, it reminded us of a boating that we did in Naukuchiatal in Nainital district without wearing any safety jacket. That was a risky one because none us knew how to swim. In Sukhna Lake, we went from corner to corner. 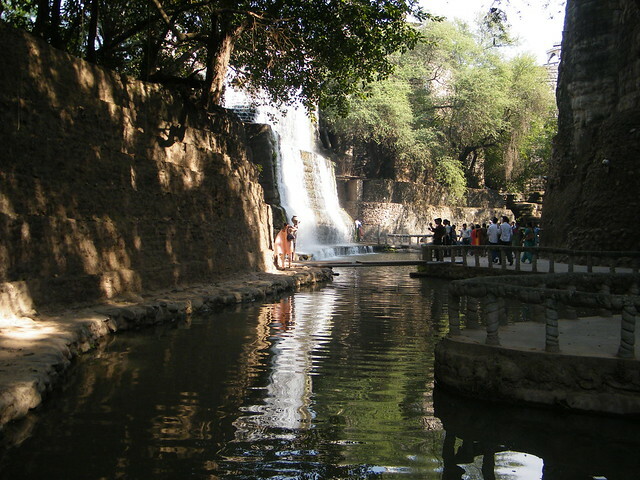 After Sukhna Lake, we went to the Rock Garden situated nearby. History of this garden tells us that it was secretly built by Nek Chand from the urban thrown-away items like bangles, ceramic pots, tiles, sinks, bottles etc. In the park, there are many sculptures made of these scrap items. Sometimes we tried to mimic many of the dance poses of those sculptures. The garden has peacocks, marching warriors, village ladies carrying water giant courtyards among many others and all made of otherwise waste materials. The beautiful waterfalls were many in numbers and near few of them you will even forget that you are in such a big city, such were the effects that these man-made structures were able to create. Then we saw beautiful fishes in the garden and after that, it was time to find us in interesting shapes in the reflection of distorting mirrors. After that, we went to Rose Garden, a botanical garden. This garden houses hundreds of different varieties of the roses and other vegetation. 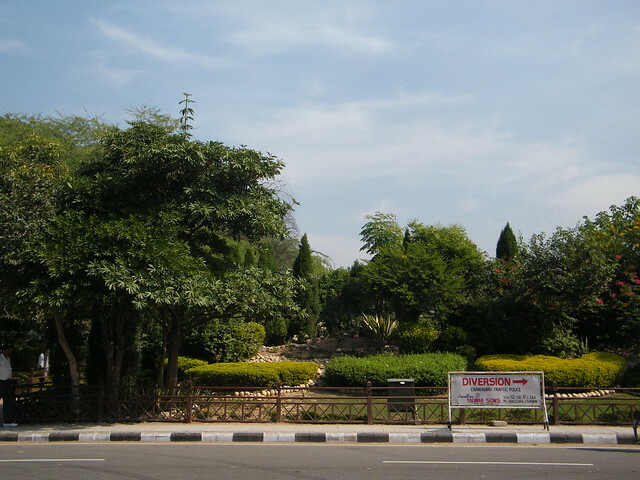 A board nearby reads the name of the park as Zakir Hussain Rose Garden and describes the count of varieties of the roses to be more than 1600. The garden was well-kept. We reached their late afternoon, but we should have been there in the evening to enjoy the beauty of the garden. 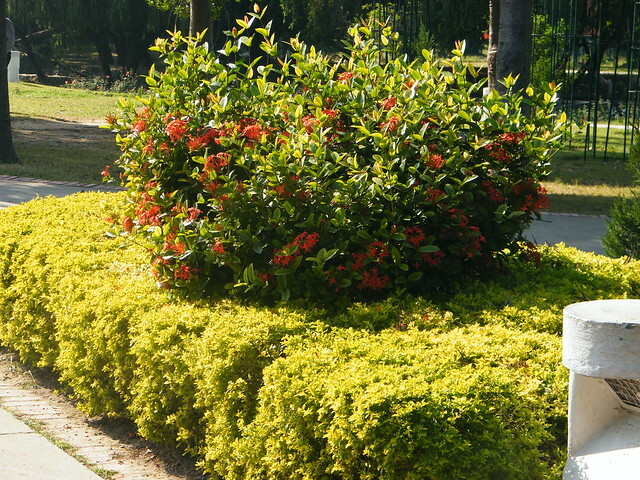 After spotting few colorful butterflies we left for sector-17, a major shopping center in the city of Chandigarh. There also we felt like we reached little early. The shops were just opening up. The visit to the Chandigarh was memorable because hardly you find such a planned city in the northern part of the country. Situated in the thick forest cover, the city was very close to nature, something which is rarely found in the cities as big as Chandigarh. See Chandigarh : Le Corbusier's city in pictures, also. See photos of Chandigarh on Flickr here.